. The Hideout On The Horseshoe's literature states that "a trip to the river doesn't have to mean roughing it. 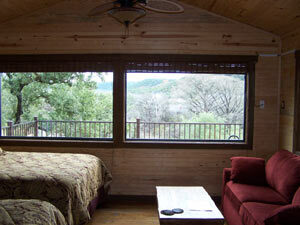 At the Hideout, we believe that nature and comfort should go hand-in-hand." 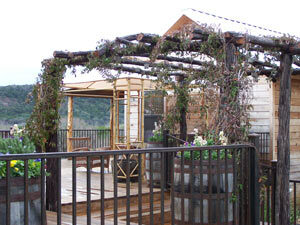 And they have done a superb job of blending a luxurious resort into the natural terrain. Words can't describe how beautiful the Hideout really is. 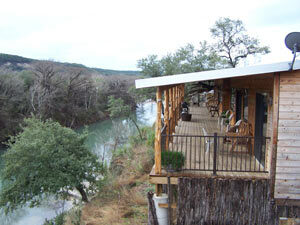 Hideout is a premier resort property on the Guadalupe River. 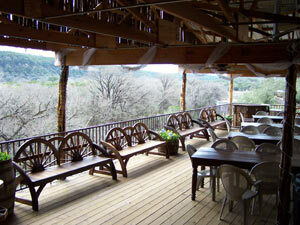 Hideout On The Horseshoe opened in June 2006 and is situated on a bluff overlooking the scenic hill country and the Guadalupe River. Hideout is about 30 minutes from either Austin or San Antonio and is located on that portion of the Guadalupe known as the Horseshoe Loop. The Hideout has 18 luxurious water view cabins that will sleep from 4 to 8 people. All of the cabins have a outstanding deck for coffee and enjoying the sunrise, socializing, or for sipping a cold beverage and watching the tubers float by. The cabins have a new stainless steel refrig, coffee maker, very nice furniture, comfortable beds, deck furniture and grill, and other appointments. 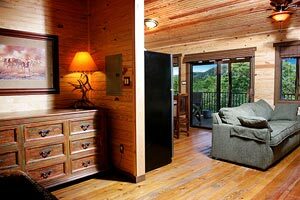 When you visit the Hideout's very cool website you can get more information including pictures, floor plans, and amenities for each of the individual cabins. 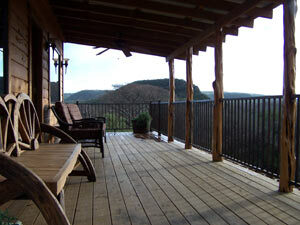 Two of the cabins are designated the "honeymoon suite" and include some very nice amenities and a fireplace. We stayed in Cabin 1 with two queen beds and a wrap around deck with an outstanding view of the river and hills - very nice! To access the water, you have a short walk down vine covered stone walkway that passes a small waterfall and leads to a magnificent waterfront patio. 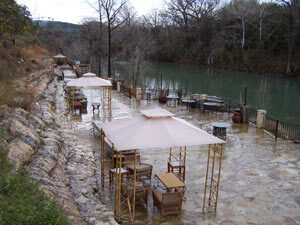 The flagstone patio is right on the water and has outdoor furniture for your enjoyment. 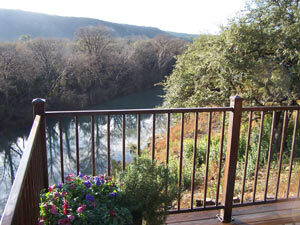 The patio is perfect for spending the day soaking up the rays, playing in the river, or socializing. What a beautiful setting for a reunion, corporate retreat, or wedding. The Hideout On The Horseshoe also has a very cool covered pavilion on the bluff which is perfect for special events or weddings of up to 100 people. Some of the other amenities of the Hideout include: horseshoe and washers pit, small playground, and an outdoor stone fireplace with seating - bring some s'mores and enjoy this neat setting. if you are staying for awhile, take a day trip to San Marcos, New Braunfels, Gruene, Wimberly, San Antonio, or Austin - each of these cities have their own unique and fun things to see and do including theme parks, quaint antique shops or Neiman Marcus, excellent restaurants, and some of the best nightlife and music (after all, Austin is the music capital of Texas). 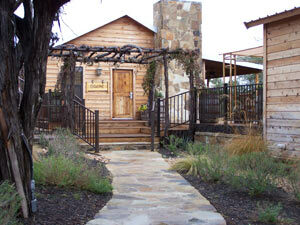 Historic Gruene is only 10 minutes away and has quaint shops, great restaurants, and the infamous Gruene Hall. If you like country music, a visit to Gruene Hall is a must - it is the oldest dance hall in Texas, hasn't changed much over the years, and has some of the best texas musicians playing each weekend. Check out Thank God for Weekends to learn more about the area and fun things to see and do. Bottom line, the Hideout On The Horseshoe needs to get on your list of places to go - you won't be disappointed. Get there soon, life is short!